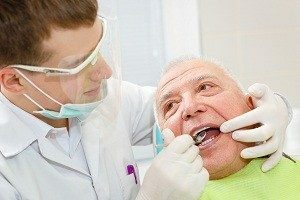 Oral health is a major necessity for senior citizens, even if only 2% of seniors have dental coverage, a sad omission from the Medicare system. Seniors have just as many oral health concerns as younger people, and maybe even more. Everyone over age 65 should find family dental in Newnan for their annual dental check. Here’s some insight into why senior dental care is important and where to find great care from a family dentist. It’s been reported that almost 1/3 of senior citizens have cavities, most of which go untreated. Even worse, gum disease and other serious oral problems are common in senior adults. Whether or not these are new problems or continuing issues from their youth, every senior should have their oral health needs met. Oral problems like gum disease and plaque buildup are common causes of diabetes, heart disease, stroke, and even respiratory complications, all of which are common health concerns for the elderly. And, despite what some people may think, associating the elderly with dentures, losing your teeth is not to be expected. It’s only a sign of poor oral health. Poor nutrition and dry mouth, a side effect of taking certain medications, can both cause tooth decay and eventual tooth loss. Even worse, the fact that people’s oral nerves diminish over the years means that the elderly might not even know if they have a cavity or loose teeth. Unlike a younger individual, they might not even feel the pain! There are many reasons that the elderly might not visit a dentist. For instance, their Medicare and/or Medicaid coverage might exclude dental care. Out-of-pocket costs for dental care can be astronomical, so the elderly might prefer not to go to the dentist at all. They might also lack appropriate transportation or suffer from limited movement. Sadly, some elderly people who aren’t mentally sound enough to make appointments might never see a dentist because their family members won’t do it for them. Don’t skip on dental care if you’re elderly. If you have senior family members or friends, ensure that they continue to have cleanings at a family dentistry at least once a year. Seniors in a nursing home should have their teeth brushed every day and should visit a dentist more than once a year. If your loved one is in a nursing home, take responsibility for their oral health, because it affects their overall bodily health. There are affordable solutions for dental care. Try opting into low-cost dental coverage plans for seniors or researching Medicaid coverage for the financially limited. Finally, research family dental in Newnan to learn about payment plans and other cost solutions for seniors.